First published in The Spectator, 7 September 2013. This entry was posted in Volume Three - The Broken Road and tagged justin marozzi, Patrick Leigh Fermor, The Broken Road on November 7, 2013 by proverbs6to10. Whilst digging around I came across this charming obituary to Paddy by Justin Marozzi who is famous for his book The Man Who Invented History: Travels with Herodotus , in which Justin describes an account of a lengthy retsina fuelled lunch with Paddy when he visited Kardamyli in 2007. The longest walk has finally come to an end. After the most dashing life of literary wanderings, in which he crossed a continent on foot, fell in love and ran away with a beautiful princess, galloped into battle in a Greek cavalry charge, secluded himself silently with Trappist monks, kidnapped a German general, became one of this country’s greatest war heroes, swam the Hellespont and built a sun-filled house in the Peloponnese where he wrote what may yet prove to be one of the finest trilogies in modern literature, Sir Patrick Leigh Fermor’s ultimate journey was the return home to die in Worcestershire at the age of 96, an Englishman to the last. The death of Leigh Fermor — friends and fans called him Paddy — removes the last link to that generation of travel writers who fought with such distinction in the Second World War. The prospect of that elusive final volume, which would see our footsore traveller and philhellene complete his serendipitous, marathon-walking tour from the Hook of Holland to reach the city he insisted on calling Constantinople, sometimes Byzantium, never Istanbul, is little short of exhilarating. All his fans who cherish the densely beautiful prose of A Time of Gifts (1977) and Between the Woods and the Water (1986) will be thrilled to hear the news from his biographer Artemis Cooper that an early draft “will be published in due course”. The posthumous gift cannot come soon enough. The celebration of a life so well lived is likely to bring a renewed flash of interest in travel writing, a genre that has, almost from its very outset, been revered and reviled in equal measure. We may not know what sort of reception greeted the “publication” on clay tablets of the Babylonian Epic of Gilgamesh, the earliest forerunner of travel writing, if not of literature itself, but we are certainly familiar with the mauling received by the Ancient Greek Herodotus, the first great travel writer and historian, an exuberant pioneer of anthropology, geography, exploration, investigative journalism, tabloid hackery and foreign reportage in the 5th century BC. Within little more than a century, Cicero’s “Father of History” had become Plutarch’s “Father of Lies”, a classical harbinger of the suspicion which has bedevilled the first-person travelogue ever since. From Herodotus to Leigh Fermor via Marco Polo, John Mandeville and Bruce Chatwin, the hostile image of travel writer as self-indulgent fantasist and fibber has never been shaken off entirely. In May, the doyen of American travel writers. Paul Theroux dropped in at the Hay Festival to promote his latest work, The Tao of Travel, an engaging distillation of travellers’ wisdom and a vade mecum worth popping into the Globetrotter suitcase this summer. The blaze of publicity surrounding Paul Theroux’s handshake that ended a 15-year feud with V.S. Naipaul, another writer who has excelled in the genre, suggests that contrary to many predictions, travel writing is in robust health. From one generation to the next it shrugs off with insouciance the obituaries that are written for it periodically by writers as diverse and removed from each other as Joseph Conrad and Claude Lévi-Strauss. Indeed the temptation must be to conclude that travel writing, like the poor, will always be with us. In Britain, which has a proud heritage in this field, the ranks of great travel writers have been sadly thinned in recent years. The monumental Sir Wilfred Thesiger, author of Arabian Sands and The Marsh Arabs, last of the latter-day Victorian explorers, died in 2003. The same year saw the passing of the magnificent, under-appreciated Norman Lewis, whose Naples ’44 is one of the classic literary accounts to emerge from the Second World War. Profoundly different in their styles and interests, these three writers were bound nevertheless by the shared generational experience of war and their direct participation in it. Thesiger fought behind enemy lines in North Africa with the SAS, Newby was one of the earliest recruits to the Special Boat Section, as the SBS was then known, and Lewis was an intelligence officer in Naples. Then there was Paddy. The last of his era was also surely the most admirable and admired of all, a Byronic incarnation of what Greeks call leventeia, defined in one of his most life-enhancing books as a “universal zest for life, the love of living dangerously and a readiness for anything”. His housemaster at King’s School, Canterbury detected “a dangerous mixture of sophistication and recklessness”. Leigh Fermor was the leading literary light among that band of travel writers who fought in the war and were coloured by it, whose lives and writings bear, to some degree at least, the imprint of that vast, world-changing hurricane. The justly celebrated Jan Morris, who caught the closing years of the war as an intelligence officer in Italy and Palestine, is already at a generational remove. War may not have defined Leigh Fermor or his writing entirely (it brought to an end the first of his two great loves, a dreamlike romance with the Romanian princess Balasha Cantacuzene), but his quintessentially dashing, devil-may-care war record certainly underpins much of the affection with which his devoted fans view him today. In some instances, such as that of “The Greatest Living Englishman” blog that was published in his honour, it is a devotion that blossoms into outright adulation. If the prose-poetry of his books is riveting, at times sublime, very occasionally purple, the narrative of his war record is scarcely less vivid. Its crowning moment came at 9.30pm on April 26, 1944, when he stepped out on to a road in the heart of the rough Cretan countryside, intercepted a German staff car and kidnapped General Heinrich Kreipe with a team of Cretan resistance fighters and a fellow British officer in the Special Operations Executive (SOE). From a literary perspective, the glory of this episode had to wait until A Time of Gifts, the first instalment of his epic walk — a version was written in 1969 for the Imperial War Museum. In it Leigh Fermor described the terrifying, 18-day manhunt by German forces sweeping the island. At dawn one morning, surveying the crest of Mount Ida, the general started murmuring his way through a Horace ode. Recognising it as one of the few he knew by heart, the Englishman picked up where the German left off, reeling off the five remaining stanzas in perfect Latin. Mani and Roumeli, which describe Leigh Fermor’s wanderings in southern and northern Greece respectively, were hailed by the FT as “two of the best travel books of the century” and contain numerous references to the courage, loyalty, humour and generosity of the Cretans among whom he fought. Artemis Cooper writes in Words of Mercury of the “unbreakable bond” war had forged between the Cretans and the SOE crowd. Typically, Leigh Fermor was not slow to acknowledge it. Thesiger was always more warrior than writer. It is only thanks to the persistent pressure of publishing friends, decades after his dramas in the desert, that we have his granite prose. He had seen wartime service under Orde Wingate in Abyssinia, served with SOE in Syria and then the newly-formed SAS in North Africa. In My Life and Travels, he wrote of his “passionate involvement with the Abyssinian cause”. Letters to his mother in 1943 describe how “bitter and discontented” he was not to have played a part at El Alamein. War was “exciting and exhilarating”. During a lunch with Thesiger in the incongruous setting of his retirement home in the wastelands of Surrey suburbia, his misanthropic growl suddenly lightened into an animated purr as he spoke of his role in the Allied campaign in North Africa, having persuaded David Stirling, founder of the SAS, to take him on. “I said to him, ‘I hear you’re going to make a raid behind enemy lines. I speak Arabic and I know the desert. Three days later we were 150 miles or so behind lines. I came upon a tent packed full with people. Luckily there was no one on guard. I just raked it with machine gun fire a couple of times. It felt rather like murder.” The glacial blue eyes glowed. The experience of war also formed a critical part of Lewis’s literary hinterland. He wrote in Naples ’44 of a decisive encounter that “changed my outlook”, shattering his “comforting belief that human beings eventually come to terms with pain and sorrow”. On November 1, 1943, contemplating a menu offering either disguised dogfish or horsemeat, he watched a group of blind orphan girls enter the restaurant scavenging for food. Each child was sobbing. “I knew that, condemned to everlasting darkness, hunger and loss, they would weep on incessantly,” he wrote. “They would never recover from their pain and I would never recover from the memory of it.” His horror of the war, combined with its alluring and unrepeatable intensity, propelled him into a lifetime of far-flung reporting from dangerous parts. It led also to his championing of the rights of indigenous peoples in “Genocide”, a seismically shocking Sunday Times article that resulted in the foundation of Survival International, the movement for tribal peoples, in 1969. War likewise left its mark on Newby’s writings. It also brought him love. He fought gallantly with the SBS and was awarded the Military Cross for his courage during numerous sabotage missions along enemy coasts. Love and War in the Apennines, another Newby classic, tells the story of his time on the run after one dramatic and abortive SBS expedition, when he was smuggled out of a prison camp and later rescued by a young woman, Wanda, his future wife. The travel writer Tim Mackintosh-Smith, who has spent most of the past decade writing an on-the-road trilogy in the footsteps and footnotes of his hero Ibn Battuta, the 14th-century Muslim traveller, says the war may have fostered a certain detachment among these writers. “War is death to, among other things, enthusiasms,” he says. “If you’ve been through it, nothing matters quite as much anymore. For someone writing travel, I think this may give a sort of lordly detachment to one’s observations, which isn’t a bad thing. I’m not sure that post-war generations can quite achieve this.” For John Gimlette, author of At the Tomb of the Inflatable Pig, war may have been an influence that “discouraged introspection and informality”. Today’s writers, he argues, have become less detached in their work, “using more humour and self-deprecation to place themselves amongst their subjects”. As the metaphorical baton passes from Leigh Fermor to Thubron, a master of lyrical prose, we lose a literary connection to that all-defining conflict of the 20th century and the more heroic age it encapsulated. The memory of it lives on, recorded in the words of historians, poets, journalists, soldiers, generals, biographers and travel writers alike. It was precisely in order to ensure that the “great and marvellous” deeds of another, much more ancient conflict were not “forgotten in time” or “without their glory” that Herodotus wrote his landmark Histories of the Persian Wars, 2,500 years ago. It is surely profoundly important that the world’s first history book, a fizzing masterpiece of storytelling, relied so heavily on experiential travel. Thucydides needed to get out more. Scanning the horizon, there appears to be little reason to fret for the future of travel writing. A genre that seeks to understand a constantly changing world, with recourse to history, geography, politics, economics, biography, anthropology, philosophy, psychology and reportage, among other disciplines, is in little danger of losing its relevance. If you want to know what life was like in late 1930s former Yugoslavia, it is hard to beat Rebecca West’s Black Lamb and Grey Falcon, a meta-travel book (1,100 pages) of astonishing compass and vitality. For Iraq in the 1920s, who better than Freya Stark and Gertrude Bell to paint a many-layered portrait? The best travel writing opens up parts of the world that other disciplines can struggle to reach — and explain to a wider audience. Consider the turmoil in the Middle East. While the breathless media rush to report the next dictator to catch Arab flu, leaving post-revolutionary countries like Egypt largely unreported in their wake, the field is left open for writers with more time and literary space on their hands to make sense of an irreducibly complicated society and situation. Digital communications, mass travel and the supposed shrinking of the world offer only the deadly delusion of a homogenised “global village”. News articles, foreign policy reports and jargon-filled government briefings on “failed states”, “post-conflict environments” and “stabilisation operations” pay only lip service to real-life complexities. What would Paddy have made of the Foreign Official who spoke to me the other day about “ground-truthing” in Benghazi? We should always beware of what Mauriac called “la tendance fatale à simplifier les autres”. Travel writing celebrates the world as it is, with nuance, shading and uncertainty. William Dalrymple, who sped to fame in the late 1980s, after Theroux, Chatwin, Thubron, O’Hanlon and Jonathan Raban had blazed a renaissance trail of travel writing a decade earlier, points to the proliferation of fine writers of the genre far beyond these shores. It is parochial in the extreme to see this as a British or Western format. Among those with Indian roots alone Dalrymple lists Shiva and Vidia Naipaul, Pico Iyer, Amitav Ghosh, Vikram Seth, Pankaj Mishra and the novelist Rana Dasgupta, now working on a study of Delhi. Dalrymple says it will inevitably be a completely new take from his own City of Djinns, published in 1993, before Delhi and India had cast loose and surged forward at breakneck speed. “Each generation sees the world very differently,” he says. Earlier this year, Kamal Abdel-Malek, Professor of Arabic Literature at the American University of Dubai, published America in an Arab Mirror, an anthology of Arab travel writing in the US during the past century that is at once unexpectedly illuminating and disquieting. OxTravels, a new anthology of writing co-edited by Rogerson, reveals a multicultural cast of 36 authors including Aminatta Forna, Oliver Bullough, Sonia Faleiro, Peter Godwin and Rory Stewart. “We could easily have added another three dozen, in a separate collection tomorrow, who would all be in the front rank,” says Rogerson. The compulsively readable Dutchman Cees Nooteboom would surely be among them. Ongoing translation of hitherto inaccessible foreign writers such as the fabulously curious, effervescent 17th-century Ottoman traveller Evliya Çelebi, author of the ten-volume Seyahatname or Book of Travels, only confirms the universality of the genre. Paddy, of course, put it differently. One of his favourite sayings, which expressed his own creed as well as our preternatural need to travel, harks back to St Augustine. He personified it with élan: solvitur ambulando — it is solved by walking. Marathon Man – which includes the account of the retsina fuelled lunch with Paddy. This entry was posted in Interviews with Paddy, Paddy's Death and tagged justin marozzi, Patrick Leigh Fermor on March 3, 2013 by proverbs6to10. Door-stepping a 91-year-old knight of the realm, second world war hero and one of the finest writers in the English language is an awkward business. Particularly when he is hard at work in his home in the southern Peloponnese trying to finish the elusive third volume of what would be among the greatest trilogies in modern literature. Yet this is no time for reticence. A man who kidnapped a German general on Crete in 1944 and then drove through 22 checkpoints impersonating him, before spiriting him on to a Cairo-bound submarine – having first bonded over a shared passion for Horace’s Odes – probably favours the direct approach. This, at least, is what I tell myself on arriving in the fishing village of Kardamyli in the Outer Mani, armed with all sorts of introductions to Sir Patrick Leigh Fermor. In the event, Leigh Fermor, known to English friends as Paddy and to Greeks by his nom de guerre Mihali, could not be more charming when I ring him from a nearby hotel. He suggests lunch. I accept faster than you can say hero-worship. The following day, the housekeeper waves me down a vaulted stone gallery, cool air ruffling through the arches, an architectural reminder, perhaps, of Byzantium, which, in a sense, has always been Leigh Fermor’s true north. It was to Constantinople – never Istanbul – that the 18-year-old set out on his serendipitous, marathon walking tour, a journey immortalised half a century later in the densely beautiful prose of A Time of Gifts (1977) and Between the Woods and the Water (1986). His stint at King’s School Canterbury, where his housemaster diagnosed “a dangerous mixture of sophistication and recklessness”, had just come to a premature end with his expulsion for fraternising too closely with the town’s female population (women have always found him irresistible). Leigh Fermor notes proudly that Christopher Marlowe was another King’s man who got into high-spirited scrapes. His education after that – and all his books display the dazzling range of his erudition – was that of a freely roving autodidact. For a moment, I think the man who stands up to greet me in this literary Elysium must be a house guest, since he looks no more than 70. “How very nice to see you,” he says. His English is polished gravel, the voice of a more civilised generation. He is clasping a Loebb edition of Herodotus and is alarmingly handsome, which means that this must be the nonagenarian Leigh Fermor, no youthful house guest. In various letters despatched to Greece I have asked, rather clumsily, if we can talk about Herodotus for a book project. We walk over to a table lost beneath a shimmering forest of glass bottles. Leigh Fermor has an enviable head of hair and is crisply dressed in blue checked shirt, russet tie, a blue jumper and corduroys. Red socks betray a note of flamboyance. A more debonair specimen of the literary man of action would be difficult to imagine. “I’ve already had a vodka and tonic so I won’t have anything,” he says. I pour myself a drink from a very large, obviously much used, green bottle with the handwritten legend “OUZO”. He draws alongside and joins me for a second vodka. His constitution is said by friends to be as robust as his wartime record. So what news for Leigh Fermor devotees awaiting the third volume, which would see him reach his beloved Constantinople after all these decades? “That’s the plan, of course,” he says. “I’ve been rereading my notes and getting things in order. Clearing the decks. But it’s all a bit grim. I’m finding writing rather difficult.” He says he has developed tunnel vision and at the moment is confronting the disconcerting sight of an interviewer with two pairs of eyes and four nostrils. He does not type, has never been very keen on dictating and has no secretary. We must keep our fingers crossed, while looking forward to Artemis Cooper’s biography. “Charge on,” is the cue for lunch. We leave the library and return to the world of Byzantium, taking our places in the gallery at a table set for two. An arch encircles a sunlit scene of bougainvillea amid a diaphanous blaze of green foliage. Four well-fed cats hover expectantly and a squadron of buzzing flies makes merry around us. Centre stage is a large carafe of chilled white wine. In fact, it is retsina, for which my host apologises when I ask what we are drinking. We set to our lunch of Herculean pork chops luxuriating on a bed of garlic and onions with spinach, potatoes and tzatziki. The retsina in the carafe descends with the winter sun. We talk about his latest honour from the Travellers Club, which last December presented a bust of Leigh Fermor, now sitting in pride of place alongside Sir Wilfred Thesiger, another of the club’s favourite sons and fellow soldier-writer. “It’s all rather terrifying,” he says. Flattering, too? “Oh, rather!” The eyes twinkle. In fact, Leigh Fermor has been serially honoured for his many achievements on the battlefield and in print. His typically dashing exploits in the Special Operations Executive, rubbing shoulders with David Stirling, Fitzroy Maclean and Wilfred Thesiger, above all the audacious kidnapping of General Kreipe on Crete, were recognised with a Distinguished Service Order. An OBE followed. He is an honorary citizen of Heraklion, Kardamyli and Gytheio. His first book, The Travellers Tree (1950), won the Heinemann Foundation Prize for Literature. In 2004, he was knighted for services to literature and Anglo-Greek relations. Ice cream arrives. I ask him whether he shares the feeling of nostalgia and regret, so pervasive in Greece, at the loss of Constantinople to the Ottomans in 1453. His writing seems to reflect this pain. Though he is not a political man, preferring to remain above or beyond the fray, he is, above all, a European. In the confrontation between east and west there seems little doubt as to where his sympathies lie. Does he feel the western world and its way of life are under threat? “It does rather feel like that, though I haven’t been keeping up on it as much as I should have,” he replies. Back to the library for Greek – not Turkish – coffee. There is a splendid photograph, taken recently, of Leigh Fermor and Earl Jellicoe, wartime comrade and commander of the Special Boat Service. Both men wear dark suits, their chests a riotous patchwork of medals. Leigh Fermor’s left hand rests jauntily on his hip. Even in his tenth decade, there is an unmistakable poise and swagger. After coffee, we walk outside into the garden. Across the water to the west lies the rump of Messenia. Beneath us is Leigh Fermor’s private little cove and steps down to the sea. This is the house that Paddy built, with his late wife Joan, in the mid-1960s. He sits for a few photographs while we swap notes on travel writers young and old. Bruce Chatwin was a frequent visitor to the Mani in the 1980s. “People have said I was a guru to him. It’s absolute nonsense. Bruce would have been appalled.” He considers him a marvellous writer and is a fan of Jan Morris, too. 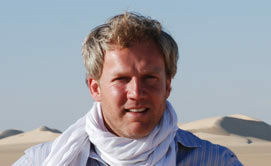 He abhors being called a travel writer, regarding it as a lesser category, “rather like being called a sports writer”. I have trespassed on his time long enough. On our way out, he suddenly leads me to another building, half hidden by the olives and cypresses. A fleeting glimpse into his inner sanctum: papers everywhere, more zigzagging stacks of books, a towering blue and white ceramic light from Portugal. His hero Byron stares at us from a plate in the centre of a broad chimneypiece. “Do drop in again if you’re ever in the area,” he says. I may have to leave my wife to become his amanuensis. This man, I reflect, as I drive away from his secluded haven, who has walked across a continent, fallen in love and run away with a princess, fought for his country, kidnapped a general, built a house, written books of dreamlike brilliance, joined a Greek cavalry charge and lived long and exceedingly well, is a true knight. Quite possibly one of the very last. Justin Marozzi is the author of a number of travel books his latest being the acclaimed The Man Who Invented History: Travels with Herodotus which includes the account of a lengthy retsina fuelled lunch with Paddy. This entry was posted in Interviews with Paddy and tagged justin marozzi, Major General Heinrich Kreipe, Patrick Leigh Fermor, Peloponnese on July 7, 2011 by proverbs6to10.